This topic teaches you how to use Power BI Desktop to create hyperlinks. Then use either Desktop or Power BI service to add those hyperlinks to your report tables and matrixes. You can create hyperlinks in tiles on dashboards and text boxes on dashboards on-the-fly using the Power BI service. You can create hyperlinks in text boxes in reports on-the-fly using Power BI service and Power BI Desktop. You can create hyperlinks in tables and matrixes in Power BI Desktop, but not in the Power BI Service. You can also create hyperlinks in Excel Power Pivot before you import the workbook into Power BI. Both methods are described below. The procedure for adding a hyperlink depends on whether you've imported the data or connected to it using DirectQuery. Both scenarios are described below. If the hyperlink doesn't already exist as a field in your dataset, use Desktop to add it as a custom column. In Data view, select the column and in the Modeling tab choose the dropdown for Data Category. 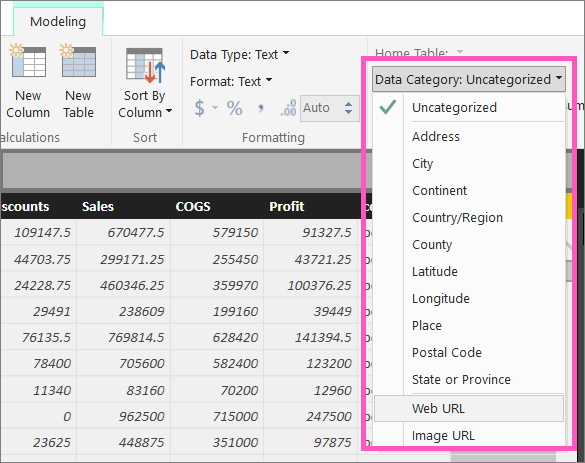 Switch to Report view and create a table or matrix using the field categorized as a Web URL. The hyperlinks will be blue and underlined. The URLS must start with http:// , https:// or www. If you don't want to display a long URL in a table, you can display a hyperlink icon instead. Note that you can't display icons in matrixes. Select the chart to make it active. Select the Format icon to open the Formatting tab. Expand Values, locate URL icon, and turn it to On. (Optional) Publish the report from Desktop to Power BI service and open the report in Power BI service. The hyperlinks will work there as well. You can't create a new column in DirectQuery mode. But if your data already contains URLs, you can turn them into hyperlinks. In Report view, create a table using a field that contains URLs. Select the column, and in the Modeling tab, choose the dropdown for Data Category. Select Web URL. The hyperlinks will be blue and underlined. Another way to add hyperlinks to your Power BI tables and matrixes is to create the hyperlinks in the dataset before you import/connect to that dataset from Power BI. This example uses an Excel workbook. Open the workbook in Excel. Select the PowerPivot tab and then choose Manage. When PowerPivot opens, select the Advanced tab. 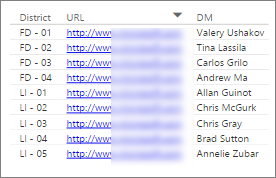 Place your cursor in the column that contains the URLs that you'd like to turn into hyperlinks in Power BI tables. In the Reporting Properties group, select the Data Category dropdown and choose Web URL. From the Power BI service or Power BI Desktop, connect to or import this workbook. Create a table visualization that includes the URL field. Q: Can I use a custom URL as a hyperlink in a table or matrix? A: No. You can use a link icon. If you need custom text for your hyperlinks and your list of URLs is short, consider using a text box instead.